It is with great sadness in my heart that I announce the parting of a very special person. 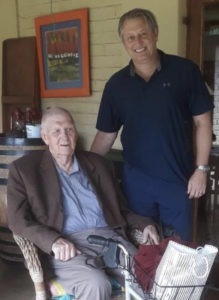 Yesterday, on 20 March 2019 Dr Herman Hamersma died peacefully at the age of 89 years. What an honour it was to have known such a man! Undoubtedly, he was one of the greatest ear-, nose-, and throat surgeons (ENT surgeons) who lived in this country. He meant so much to all of us. Where do you begin to acknowledge all his accomplishments? To his family, friends, colleagues, patients and students he was an icon, a beacon of hope and inspiration throughout his life and career. In my own personal life, he meant such a lot. He was my mentor and my friend. He was to me like a father and inspired me to do the work I do. He was the one that taught me otology and neur-otology and made me love it. He was one of the most dedicated people I have ever known, loved by so many. He will be missed by everyone. In his work he will be remembered for many outstanding milestones. If I have to mention one it was his passion and dedication to many patients suffering from sclerosteosis. He was the world expert on this disorder. I am sure that a lot will still be written on all his work and life time achievements. Two weeks ago, I felt the urge to visit him in Middelburg, Mpumalanga. I had not seen him for a long time and visiting him was special, sacred in a certain way. We had such a nice time and talked about so many things. It was as if I was driven to him and I felt the intense sadness that when I left that I would not see him again. I wiped a tear when I drove away. Today I have to wipe many. Recently Dr Hamersma lost his wife Hannie and today they are reunited with their daughter, Magdaleen. To his 3 sons that stays Bouwe, Maarten and Pieter, my sincerest condolences. You can be so proud and great full for having such a very special father! Thank you for sharing him with me. We that stay behind will never forget him. All the “Jannies” and “ Sannies” will miss him. We will continue his work in the way that would have made him proud. Goodbye Dr Herman Hamersma till we meet again.